The message from Fort Worth, Texas: no more religious advertisements allowed, at least on its transit system. The pro and anti-religious ad battle has been front and center this holiday season. Atheist groups and the Catholic League had a billboard brawl in New York late last month, and now the fight has reached Texas. The Board of the Fort Worth Transportation Authority (The T) voted unanimously last week to formally adopt an advertising policy for all T property which includes a ban on faith-based ads. The vote was prompted after a recent ad purchased by The Dallas-Fort Worth Coalition of Reason which caused a lot of commotion in town. 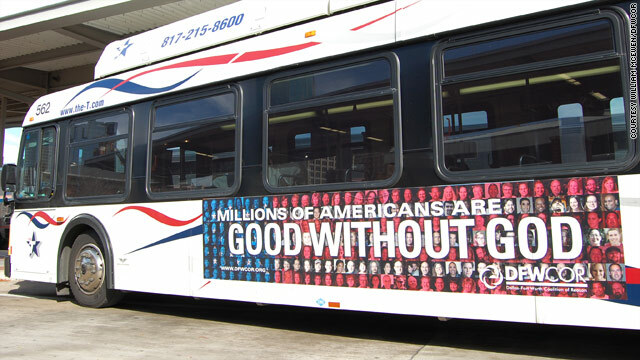 The ad posted on four buses reads "Millions of Americans are good without God." Joan Hunter, communications manager for The T, said the decision for the ban was not based on the content of the Coalition's ad, but rather the amount of resources the department had to spare to field concerns in reaction to it. "The demands on our time to respond and trying to engage us as a public forum was pulling us from focus on the operation of a transit agency and that is our business," Hunter said in an e-mail message to CNN. The T already had guidelines in place against tobacco and alcohol ads, some local political ads, and those deemed obscene. In a news release, The T says the new policy will "exclude any ads with religious, non-theistic, or faith-based content and all political ads." "Our policy regarding belief ads that we had was impartial and had worked without interruptions to our time and resources in the past," Hunter said. She also noted there are several other ads posted on their bus fleet right now, including one that says "Jesus is the reason for the season" and another paid for by a Catholic organization. Terry McDonald, coordinator of the Coalition, said the group's campaign was not scheduled to come out during December. It was being worked on last summer to coincide with a book signing by Harvard humanist chaplain Greg Epstein. When the event fell through, the Coalition thought the title of Epstein's book, "Good Without God," still held an important message. "The reason for our campaign is to let people who are nonbelievers know about the Dallas-Fort Worth Coalition of Reason and that has succeeded very, very well," McDonald said. He said the group didn't expect there to be anywhere near this much publicity but with the media coverage of the controversy the Coalition's affiliates are seeing their memberships increase and they've received donations from across the country. Kyev Tatum, pastor of Friendship Rock Baptist Church in Fort Worth, called The T Board's vote "a dangerous precedent" because it only took a matter of days for religion to be taken out of public policy. Tatum had called for a boycott of the buses when the controversy began. "The compromise was worse than what we had before," Tatum said, "because the compromise says Christians can no longer advertise and we don't like that." Any current advertising with The T that falls into a banned category will be allowed to remain in place through the remainder of the contract. The Coalition's ads will expire in early January. Hmmm... a bunch of christians complaining about the actions of other christians (look at who runs the T), and blaming it on atheists. When you people start thinking, I'll start giving you credit. But, for now, I'll do as you do and blame your ignorance on your imaginary friend, afterall... everything flows from your imaginary friend, right? The good and the bad, your intelligence and your ignorance. Why take ownership of your own failings or successes when some imaginary being pulls all your strings? Try all you want fools you will never get rid of God! Let me see if I understand this correctly. To gain entry into heaven I must accept Christian doctrine by faith and obey God's laws. If I succeed I spend eternity in heaven, if not eternity in hell. Eternity must be longer than a thousand years, a million, or even a billion. Quite a reward for blindly accepting a doctrine by faith alone. Quite a punishment for making the wrong choice. And if I choose to be a Hindu, worship Buddha, follow Spinoza or Confucius, I get forever in torment by default. Doesn't seem quite fair to me. Don't think I want to worship the god that has those requirements. Religion is simply a matter of geography. It has nothing to do with the existence of mystic deities. Your faith is what you were born into, not what you chose by examination. All men fear dying, religion eases the pain. One thing is provable, the more dogmatic the believer, the less intelligent he is. GINCAS, you have no basis for this and we KNOW you have no basis for this because no reliable statistical study of American prisoners has ever been done. And we also know you are not only wrong, but dishonest because you are using a bait-and-switch on his definition of atheist; only 0.7% of Americans actually call themselves atheists versus the 15% who the American Religious Identification Survey describes as None/No Religion. Moreoever, we actually have comprehensive data regarding the United Kingdom. In fact, that's likely where you got your imaginary number for American atheists in prison, from the UK, which reported 122 atheists being held in English and Welsh jails That just happens to be 0.2 percent of the 65,256 prison population there. But in addition to those 122 atheists, there also happened to be another 20,639 prisoners, 31.6 percent of the total prison population, who claimed to possess “no religion.” And this was not simply a case of people falling through the cracks or refusing to provide an answer; the Inmate Information System is specific enough to distinguish between Druids, Scientologists, and Zoroastrians as well as between the Celestial Church of God, the Welsh Independent church, and the Non-Conformist church. It also features separate categories for “other Christian religion,” “other non-Christian religion,” and “not known.” At only two-tenths of a percent of the prison population, self-identifying atheists are, as previously suggested, extremely law-abiding. But when one compares the 31.6 percent of imprisoned no-religionists to the 15.1 percent of Britons who checked “none” or wrote in Jedi Knight, agnostic, atheist, or heathen in the 2001 national survey, it becomes clear that their practical atheist brethren are nearly four times more likely to be convicted and jailed for committing a crime than a Christian. In other words, No Religion atheists are without question much more criminally inclined than Christians even if self-identified Scarlet-A Atheists are not. And since you used the much larger 10% figure, you clearly have the No Religion atheists in mind, which shows the disingenuous nature of your original comparison between the ratio of Christians/Christians and Atheists/atheists. Remember, you can't have your own facts, GINCAS! sheep will always be sheep! All religions are the subjugation of self AND others. No more; no less. Agnostics and atheists think for themselves – no doctrines, fable, fairytale, scripture, etc. crap.